H2Odyssey TORID Pulse "1 Left!" We have the newest toy to hit this dive market in a long time in stock and ready to ship today! You just need to purchase one or two and go have fun. The H2Odyssey TORID Pulse is a Unique Signaling Devise or Just Plain Fun You Decide! Get your Buddy's Attention in Limited Visibility, at the Surface, Blast Water 15' (4.6 meters) into the air to get the Dive Boat's Attention, Signal someone Below you while you are on the Surface are just a few Safety Uses for the H2Odyssey TORID Pulse Bubble Ring Gun. When used for Fun, Play "Capture the Flag" and many other "Paintball" Style Games. Whatever you use it for this is One-Cool Underwater/Surface Tool / Toy. At this price purchase 2 and have fun! The TORID Pulse produces Perfect Bubble Rings Every Time you Pull the Trigger. Adjust the Air Rings while Shooting, from Fine-and-Fast to Large-and-Slow. The TORID Pulse is a Patented Signal Device that can send a Bubble Air Ring up to 35' (10.7 meters) not just Ascending to the Surface (like those who know how to make Bubble Rings with their Mouth), but Horizontally through the Water! Need to get your Buddies Attention, just tag them with an Air Bubble Ring. The TORID Pulse is Depth Rated to 60' (18.3 meters) TORID Pulse even Banks" Bubble Rings off the Surface! The TORID is made from Durable Corrosion Resistant Materials with a Cast Aluminum Body. 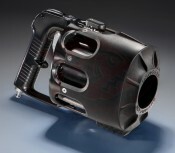 The TORID Pulse gun comes with a Quick-Disconnect Fitting that can be attached to the Second-Stage End of a Standard LP Regulator Hose "To use this you must have a low pressure hose!". The TORID Pulse can be Easily-Disassembled for Servicing and Maintenance, comes with an Owner's Guide and is covered by a 12 month limited warranty. Unique Signaling Devise or Just Plain Fun You Decide! Banks" Bubble Rings off the Surface! Shoot Bubble Air Ring Up to 35' (10.7 meters) Horizontally through the Water!